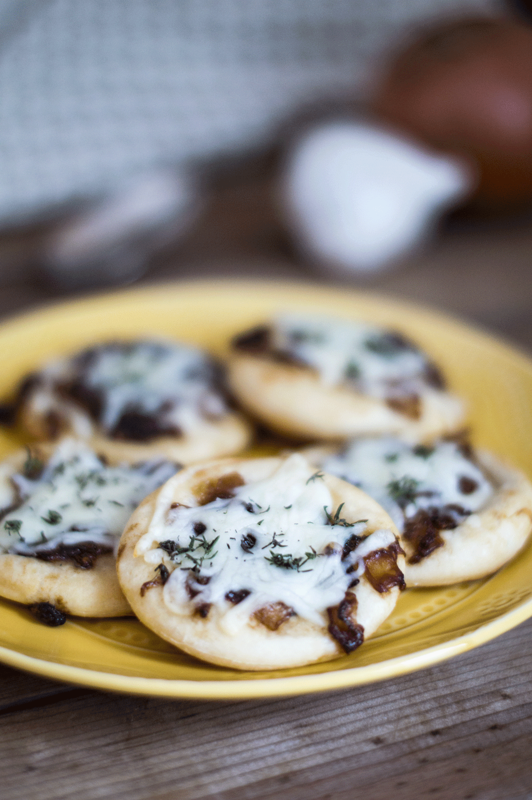 Bite sized pizzas with a French onion twist. 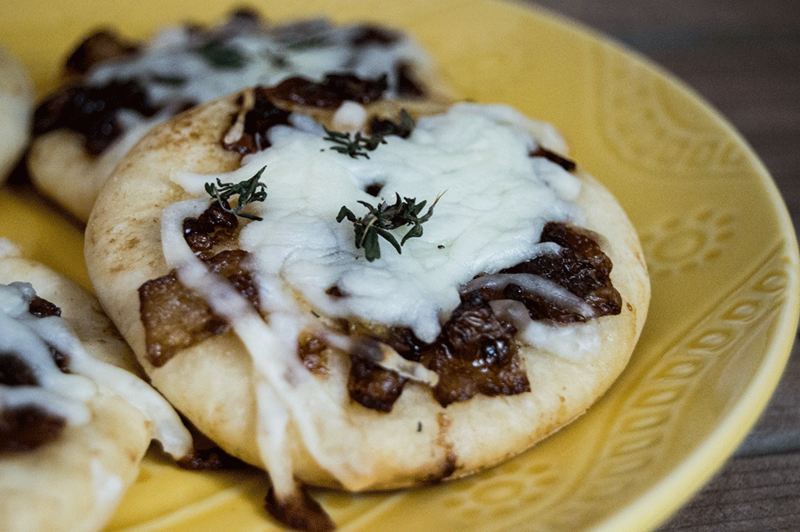 Two of my favorite things: French onion soup and pizza – what could be better? 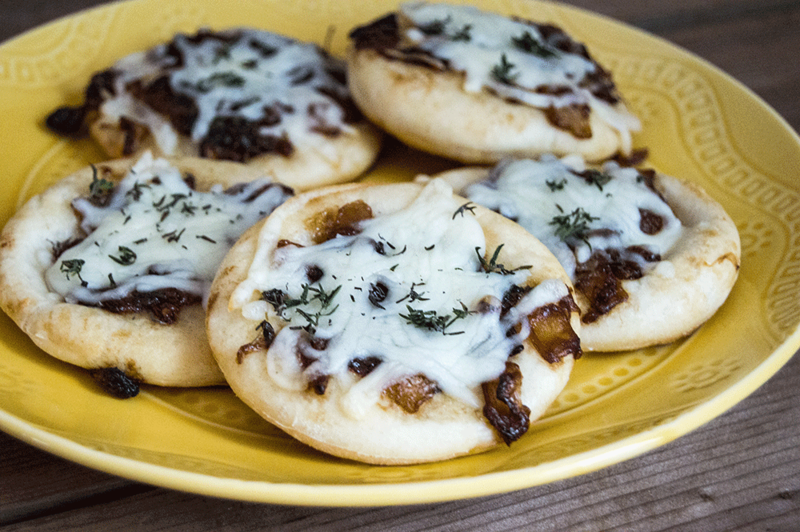 With a homemade crust, these mini pizza bites combine the best of both worlds - sweet and tangy caramelized onions on a crispy crust. I made these for a party a few weeks back, and they disappeared faster than anything else on the table - and left many people requesting the recipe, so here it is! 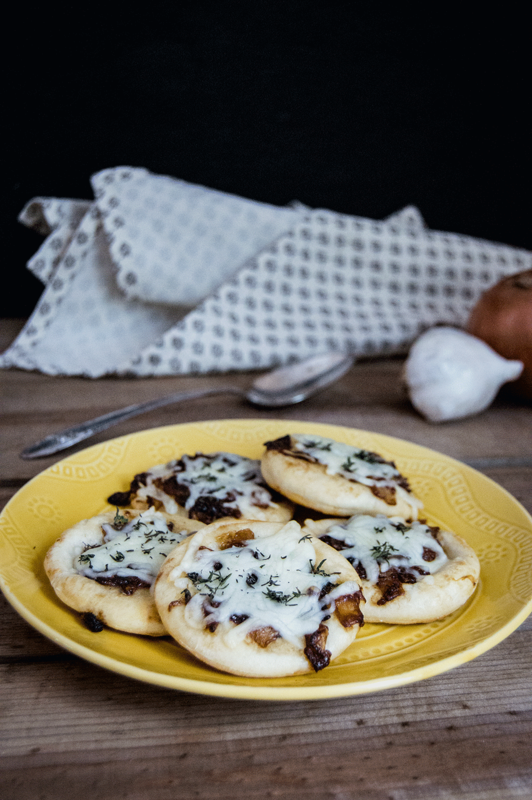 And if you don't want to make these for a party appetizer, they are also perfect as a full dinner - just don't cut the dough into individual circles and you've got yourself an entire French Onion pizza, just like that! In a large bowl, whisk together the dry ingredients for the dough. Drizzle in half of the oil, and stir until a crumbly meal forms. Then pour in the water. Use a wooden spoon to stir until a sticky dough forms. Tip the dough out onto a floured surface and knead. Use the remaining olive oil to grease another bowl, then place the dough into the bowl and cover with plastic wrap. Let rise in a warm place for at least one hour. While the dough rises, heat olive oil over medium high heat. Sauté the sliced onions for about ten minutes, until they start to brown and caramelize. Sprinkle in the brown sugar and thyme then continue to cook, stirring constantly, for another five minutes. Then add the balsamic and let cook for another five minutes, until the moisture has evaporated. Remove the topping from the heat and let cool in the skillet for about a half hour, or until the dough has doubled in size. Preheat the oven to 425 F. Punch down the dough and knead until smooth. Separate the dough into a dozen equal sized balls. Roll out the dough into thin circles, then arrange on a baking sheet lined with parchment. Spoon about two tablespoons of the onion filling on each dough circle. Add the gruyere cheese onto each, then pop into the oven and bake for ten to fifteen minutes. Sprinkle on any remaining gruyere and thyme, for garnish. Serve hot or room temperature. Enjoy!